Red Diamond (Dennis Hopper) is a small-time con artist trying to make one final score so that he can retire. 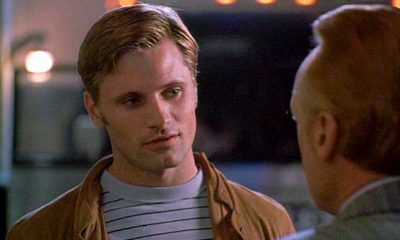 He teams up with Ronnie (Viggo Mortensen), a young dim-bulb hoodlum who manages to kill a Treasury agent in the process. The agent’s partner, Jimmy Mercer (Wesley Snipes) wants revenge and is allowed one week to try to catch the pair of killers. Red manipulates Ronnie into more crime and violence, trying to raise money to repay his creditors. When caught, Red sets Ronnie up for the fall. Music by Cory Lerios and John D’Andrea. No known soundtrack album. Images © Hexagon Films / Warner Bros.